In Croatia around 380,000 tons of food are discarded every year, while at the same time around 630,000 people live on the edge of poverty and sometimes go hungry. This shocking fact was presented at the conference “Fashion Week Spring 2018 – Food: policies and innovation” which began on Friday, 8 June 2018 at 9 am, on the Rijeka Delta in the former IVEX building. The conference is part of the Sweet and Salty programme line of Rijeka 2020 – the European Capital of Culture, and is organised by the Center for Advanced Studies of the University of Rijeka, in cooperation with the Centre for the Culture of Dialogue and the Food Network. Its intention is to address the problem of excessive disposal and insufficient donating of food, as well as offering innovative and necessary solutions for food growing in cities. The conference was opened by the Mayor of Rijeka Vojko Obersnel, who warned that our society is throwing away huge amounts of food, particularly shopping centres which throw away food whose expiry date has passed while social supermarkets remain empty. Obersnel commended the idea of urban gardens adding that he has a small garden himself. Assistant rector of the University of Rijeka Dr. Sc. Dora Smolčić Jurdana pointed out the importance of sustainability in food production and distribution, while Idis Turato, programme manager of the Sweet and Salty programme line of Rijeka 2020 – European Capital of Culture noted that we are witnessing a time in which classical agriculture no longer exists because everything is digitised, including food production. Turato sees urban agriculture as a possible solution, i.e. turning to food production in cities. On behalf of the Deputy Prime Minister of the Croatian Government Tomislav Tolušić, the Deputy Minister of Agriculture Jelena Đugum addressed the conference and expressed the support of the ministry to the organisers. The Ministry of Agriculture is currently working on legislative solutions that would increase the amount of food available for donation. Through its Food Agency the Ministry is currently conducting a study on the durability of foodstuffs, and will then publicise recommendations on the date of usability of foodstuffs with imprecise labels such as “best before”. The ministry is preparing a plan to reduce food waste by 2023 and it was also reported that in 2016 in Croatia only 9.5 million kunas’ worth of food was donated. On the first panel titled “Food Policy: European Future” greatest interest was expectedly drawn by the appearance of MEP Biljana Borzan, the European Parliament food waste rapporteur. In her presentation, Borzan emphasised that we live in a Europe of contrasts where much of the food is thrown away, while a part of the population goes hungry. Despite all of the initiatives, only 0.6 percent of the food is saved from being thrown away, which means that food waste has become a bigger problem than packaging; households are in the lead with 53 percent of food discarded. Dražen Šimleša of the Green Network of Activist Groups stated an interesting fact that when purchasing food directly from producers only 6 percent is wasted, while supermarket shoppers throw away 50 percent of the food they buy. The programme has been designed and organised in close co-operation with the Food and Community project, funded by the European Social Fund and the Croatian Government’s Office for Associations. The conference continued in the afternoon with the panel “Donators’ Perspectives”, attended by representatives of Konzum and Dukat, Winners of the “Najdonator” (“Best donor”) Award as the companies that donated the most food last year, and representatives of the Croatian Association of Family Farms “Life” and the Institute for Socially Responsible Business. Along with the obvious benefits of positive practices such as food donation, the panel also touched on the issues encountered when donating. Ivana Džakula, Director of Konzum’s Business Support Sector, noted that although tax incentives are often considered a company’s strongest motive when deciding to donate food, the benefits are multifaceted – from developing social responsibility, environmental benefits, improving a company’s reputation, as well as the fact that it is economically more cost-effective to donate than to throw away food. An increasing number of companies are starting to recognise the benefits and it serves as an incentive for them to start acting more responsibly. Despite the fact that as of 2015, donated food in Croatia is exempt from VAT, the level of donations has not increased significantly. Problems are mostly logistic in nature – issues with transport of donated goods and connecting with recipients who are not adequately equipped. Kristina Klarić Rubčić, head of Dukat Corporate Communications, said that donating is administratively complicated, as it involves an enormous amount of paperwork, as well as the hiring of additional staff. Bureaucracy as one of the biggest obstacles to increasing food donations was also emphasised by Marina Tomić from the Institute for Socially Responsible Business; the solution lies in following other countries’ practices as well as education and accepting responsibility by all involved. Vladimir Margeta, the President of the Croatian Association of Family Farms “Life” concluded that developed awareness comes with a developed society and a stable economic situation in the country. The last topic of the first day of the conference, “How much food is thrown away”, included four presentations. Branka Ilakovac from the Food Waste Prevention Centre presented worrying data – the common thread of the conference – that a third of the produced food goes bad or is thrown away, creating 1.3 billion tons of food waste per year globally, while in Croatia about 380,000 tons end up in landfills. 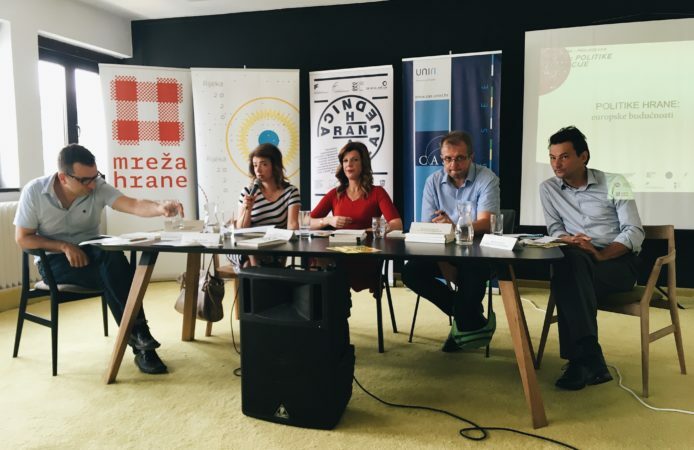 The same information was supplemented by Ana Marija Cuglin, a student from the Faculty of Economics and Business in Zagreb, who conducted research on food waste in restaurants. Problems are numerous: from determining the amount of food being thrown away daily and studying the food ordering habits of guests, to the lack of recycling practices in restaurants. The Slovenian experience was presented by Urša Zgojznik, president of the Ecologists without Borders Society, through a survey about food waste, estimating that 153,951 tons of food were thrown away in Slovenia. She also presented the project “To everyone’s benefit” focused on education and networking through a platform linking NGOs, ministries, public utility companies and retailers as well as the science sector, which among other things resulted in the VAT exemption of food donations. Zgojznik also presented the project “Don’t waste food”, which analysed the situation with food waste in hospitals and retirement homes. As a representative of the Ministry of Agriculture, Marija Batinić Sermek from the Food and Phytosanitary Directorate presented the results of research on food donations in Croatia as well as the Republic of Croatia’s plans for waste prevention and reduction for the 2018-2022 period. The autumn of this year will see the launch of a pilot project, an IT platform that will act as a virtual central intermediary body for food donations; the project will be tested during the following year, and by the end of the year, a feasibility study for food banks is planned. During the discussion many positive practices were mentioned that have been in place for some time, e.g. in France, New Zealand and Scandinavian countries, proving that education, awareness-raising and a hands-on approach can bring tangible results.